As glamorous as they are, not many bikes have made it in the movies! One that did swan serenely across screen was a Harley-Davidson. The film was Electra Glide in Blue. 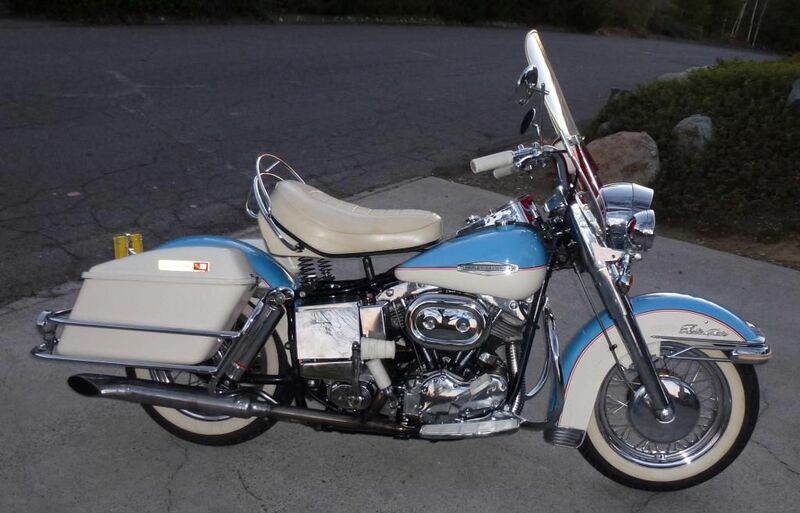 The Electra Glide lived up to its star billing! It caught Harley-Davidson's 'free-wheeling' spirit, to a tee. A kingpin of long-legged tourers, the 'Glide' was American to its apple-pie core. It was built to go places! 'It's a big country', as another American movie had it. Styling-wise, the Glide is pure Harley. Big everything, basically! Big fenders, big tyres, big tank. Big attitude, while we are at it! No marque does machismo quite like Harley-Davidson. If you hate being stared at, don't even think about it. On a Harley, you are a star! Whether you like it, or not. There are those who would give anything for that kind of kudos - as the company accounts no doubt confirm! Though, to be fair, having started out in a shed in Milwaukee, the Harley brand-name has paid its dues. On the technical front, numbers are suitably huge. The '65 Electra Glide's motor was 1,198cc - with a 100.6mm stroke. In a word, 'torquey'! That translated into a top speed of 95mph ... which was pretty quick, at the time. And - thanks to all that torque - getting there was even quicker! Mind you, 770lb was a lot of weight to shift, so the Glide needed its 'pulling-power'. But then, as a movie star, it was always going to have plenty of that! The Electra Glide ripped up the red carpet - and did so in style. To paraphrase a line from yet another movie ... 'Here's looking at you, 'Glide'!